Failure of reinforcement wires under load in a pre-stressing system can result in death or serious injury. Most failures occur at the anchorages and are due to poor maintenance and poorly trained operatives. (a) Pre-tensioning. This system is normally used for factory production. The steel tendons are tensioned and held in position while concrete is cast into moulds around the tendons. Once the concrete has set and achieved a certain strength, the tensile force is released and the stressing load is transferred to the concrete. b) Post-tensioning. This system is normally used for site production. A precast concrete unit which has achieved sufficient strength for handling, transporting and positioning; or a cast in-situ concrete structure, has tendons inserted into ducts in the concrete. The tendons are then stressed and anchored at each end. This compresses the concrete locally and allows it to carry a greater tensile load. Prestressed concrete beams and planks are very strong if they are handled and used by following the designer's instructions. They must only be lifted as intended by the designer otherwise they can fail without warning. They also need to be stored on supports as intended by the designer to avoid damage that could also lead to failure. 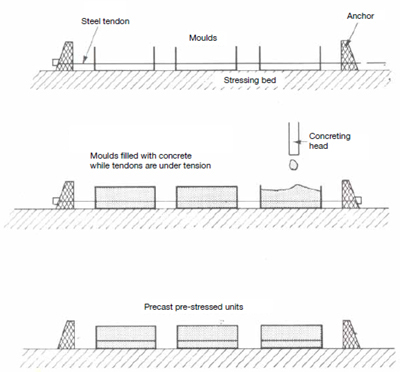 For more information on factory production of prestressed concrete products see Code for Pre-stressing published by The British Precast Concrete Federation.